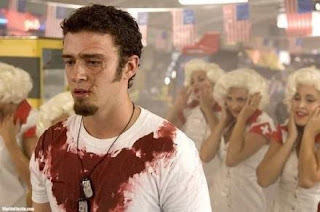 "Southland Tales" is astonishingly bad. I'm actually impressed with how bad it is. It most certainly ranks in the upper reaches of my unregulated list of worst movies of all time. Without a traditional theatrical release the film was saved the dishonour of complete trashitude, but by it's disastrous Cannes screening in 2005, we all knew Richard Kelly's follow-up to "Donnie Darko" was a bomb. How the film got into Cannes is a mystery and the programmers should really be embarrassed. There have been disastrous screenings before, but there is absolutely nothing of value to cling onto. It's the clear the cult of "Donnie Darko" had clouded everyone's opinions of Richard Kelly as a filmmaker, because even with 10 producers credits he seemed to have been given free reign to free associate his thoughts onto celluloid. The plot is incomprehensible, but the broad strokes go like this: Its a couple years into the future and America has just suffered another terrorist attack. The country is divided into two extremes - ultra leftist revolutionary and ultra-right wing conservatives. A group of neo-Marxixts hatch a plan to subvert the Orwellian actions of the Government surveillance agency USIdent by infiltrating their organization and killing their leader (I think). Boxer Santaros (Dwayne Johnson), a Hollywood celeb and husband to the Vice-President has been kidnapped by the Marxists and used in their nefarious plans. He also holds the key to unlocking the secrets to a new form of alternate fuel as well as some form of fourth dimension/time travelling device. Saying the film 'meanders wildly' is an understatement, but Kelly juggles dozens of characters, played by recognizable faces to hammer home a hodgepodge of ideological statements about the environment, the Patriot Act, terrorism, extremism, etc etc. Kelly attempts to make it all palatable with satircal humour, but it only comes across as absurd. Without a basis of reality, it all comes unglued fast. The cast is as perplexing as the plot. Let me just roll off the names, other than the leads listed above who play significant roles in the film there's Mandy Moore, Christopher Lambert, John Larroquette, Will Sasso, Wallace Shawn, Justin Timberlake, as well as a number of SNL Alums, Nora Dunn, Amy Poehler, Janeane Garofalo, Cheri Oteri and Jon Lovitz. Oh yeah, that old lady from Poltergeist is in it as well. All of the actors actually perform as best they can, especially Dwayne Johnson's stone-faced lead performance. Kelly's ambition is clearly longer than his reach. The film even has the audacity to begin with "Chapter IV" - a la Star Wars - telling us there's even more story to tell which he hasn't put on screen. The intertitles which are usually there to help us out, are even more idiosyncratic than the dialogue. The chapters are labelled: "Temptation Waits", "Memory Gospel" and "Wave of Mutiliation". The grandiose failure of this film is impressive, because I'm sure at the script stage it barely made sense either. Since the actors performed as best they could with the material, there's no one else to blame for it's commercial failure than the producers who financed it. Clearly a lot of time and effort went into making the film, it's polished with all sorts of top notch special effects, graphics, music etc. Perhaps they thought Kelly with carte blanche could turn in his "Magnolia". It will be curious to see how this will affect his career. The straight-to-video release will surely quell the damage. Great review! haven't had a 1 star in a while. Where do I find the 'Unregulated Worst List'? Batman and RObin with George Clooney and Arnie Schartz is up there too!